Sho Shin became king in 1477 at the young age of 13. The son of Sho En, he was appointed king after a brief period where another held the throne for six months before abdicating, thereby making Sho Shin the third king of the second Sho dynasty. He began a 100 year period of creative activity for Okinawa. Over his long tenure of 50 years as King he brought many positive changes to Okinawa. See my previous posts on his administrative changes and royal court ranking system. Not only did he support and nourish culture and the arts, he also used his military powers to keep the entire island chain under firm control, especially the outer islands to the south and north of Okinawa Island. In 1486, the Shuri government established an outpost on Kikai Island to the north to oversee and protect their trade routes to the north – to Japan and Korea. In the same year, Yaeyama and the southern islands, which had been paying tribute to Okinawa since as far back as 1390 began a rebellion against Shuri control. The southern islands were an important part of Shuri’s trade route to the south – China, the Indies, and Southeast Asia. The Yaeyama resistance was led by their aji Oyake Akahachi. Yonaguni Island also resisted, led by a ruler named Unten. 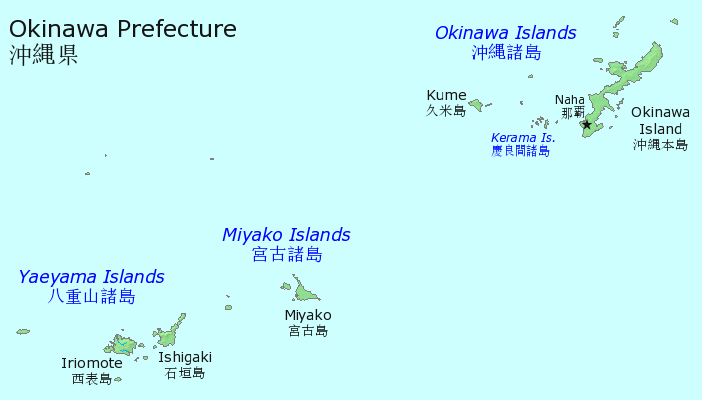 The island of Miyako was led by the Nakasone family. 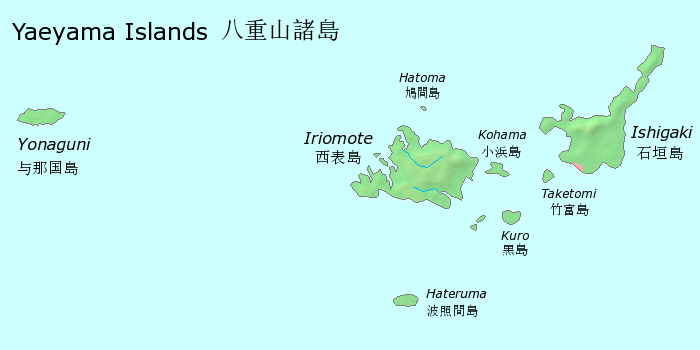 Although the Yaeyama islands are larger in physical size than Miyako, and with greater resources, the dominant power in the south was Miyako Island. Why this is so is not clear, although Georg Kerr speculated that mountainous terrain and frequent outbreaks of Malaria as well as snake infestations may have been factors, while Miyako is flat and dry, thus a more stable environment for survival. Still, the reasons are not totally clear. Miyako and Yaeyama were strong rivals and competed fiercely for trade with Okinawa Island. In 1500, Nakasone learned that Akahachi on Yaeyama was planning to invade Miyako and take over. Nakasone counterattacked in a surprise move and overwhelmed Akahachi’s forces. He also conquered Yonaguni Island and took Unten’s daughter as hostage. After he returned home to Miyako, he was surprised to find himself facing a force of 3,000 men sent by Sho Shin from Okinawa Island to take control of the southern islands. He was vastly outnumbered. Nakasone quickly negotiated a surrender which saved the residents of Miyako from ruin. He surrendered to the Shuri forces, and surrendered his newly conquered territories as well. Thus Sho Shin regained control of the southern islands. For his “cooperation” Nakasone was recognized as Chieftain of Miyako. Because of the Shuri and Naha system that catered to relocating and supporting all royal families in those towns, the local Okinawan economy was not able to keep up with the large demands for resources that this created. Okinawa was therefore heavily dependent on foreign trade to keep up the wealth and standards of the aji in order to maintain the lifestyle to which they had become accustomed. At the time of Sho Shin’s reign, the Okinawan trade routes extended south all the way to the Indies and Southeast Asia. They traded with Muslims from Egypt and Saudi Arabia, Persians (Iranians), Indians, Turks, Philippinos, Cambodians, and Malaysians, among other countries. At the time, Okinawans traded gold, copper, weapons of all kinds, fans, paper, silks, porcelains, grains and vegetables. Their wares had a reputation for being high quality goods from China, japan and Korea. Some called Okinawa the Milan of China. The Okinawans in return would sell to the Japanese, Chinese and Koreans goods from the south, such as clothes, fishing nets, and wines. Okinawa’s first contact with Europeans occurred in 1511 in Southeast Asia. Primarily Spanish, Portuguese, Dutch, and English, these sailors competed strongly with Okinawa. This competition slowly but surely cut into Okinawa’s trade routes to the south over time. One account described in George Kerr’s book "Okinawa: the History of an Island People", gives a description of Okinawans from the eyes of Portuguese adventurers at the time. "... the Malacca people say that they are better men, and richer and more eminent merchants than the Chins [Chinese]. Of these folk we as yet know but little...."
"... they are men of very reserved speech, and do not give anyone an account of their native affairs...."
"...the men are fair; their dress is like a cloak without a hood; they carry long swords after the fashion of Turkish cimetars, but somewhat more narrow; they also carry daggers of two palms' length; they are daring men and feared in this land [of Malacca (Malaysia)]. When they arrive at port, the do not bring out their merchandise all at once, but little by little; they speak truthfully, and will have the truth spoken to them. If any merchant in Malacca broke his word, they would immediately take him prisoner. they strive to dispatch their business and get away quickly, for they are not the men to like going away from their own land. They set out for Malacca in the month of January, and begin their return journey in August or September...."
The Portuguese were extremely curious about all the Okinawan goods, especially all the gold that the Okinawans traded. In 1517 the Portuguese launched an expedition to find this mysterious Ryukyu and look for all the gold they seem to have. The mission got as far as Fukien, China, before it was abandoned. In addition to losing trade due to European competition to the south, Japanese pirates, or wako, were also becoming a big problem, raiding coastal villages and attacking seaports, where they looted and pillaged, as well as taking human captives to sell into slavery or prostitution. The loss of trade due to Europeans and pirates would come to be an even bigger problem under the next king, Sho Sei. Sho Shin ruled over what would be the most prosperous times for Okinawa. Despite this prosperity, things would continue to become more difficult for the next several generations of kings to follow. Okinawa and the Japanese Pirates - The "Wako"